Björn talks about CHESS and Mamma Mia! in the BBC series ‘The Story of Musicals’ currently airing. The series traces the evolution of musicals from their early beginnings right up to the present day. Episode 2 features many of the 1980s blockbusters like Les Misèrables, Cats and Phantom of the Opera and also features a segment on CHESS which includes interviews with Björn, Sir Tim Rice and Elaine Paige. The CHESS story both in the West End and on Broadway is covered briefly and not much new is discussed – apart from one of the reasons cited for its lack of longevity being the end of the Cold War and the collapse of the Berlin Wall. Björn jokes that he was “pissed off” when that happened! Tim once again talks about the cerebral nature of the plot and the fact that it is in many respects a ‘grown up’ story that takes some following especially when “three or four voices” are all singing different lines. He suggests that it could have benefited from having subtitles. Elaine Paige also suggests that the subject matter itself was probably enough to put some people off. In Episode 3, the so called “jukebox musicals” were examined and Mamma Mia! is discussed in some detail – especially the decision to go ahead and open the show on Broadway directly in the wake of the 9/11 events in New York. I am truly surprised that it took the world so long to recognize the genius in ABBA. I saw the musical potential coming with “I’m a Marionette”. 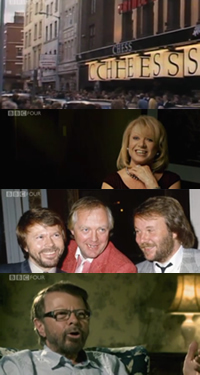 ABBA was the collision of so much talent that they can only be classified as “The Perfect Storm”. Thank you Benny, Björn, Agnetha and Frida for a lifetime of musical euphoria! If only the series had ended with an announcement of a new production of CHESS in the west end. I’m sure this will happen. I also don’t like the expression Jukebox musical, Chess and Mamma mia are just Great Musicals like Sondheim or Gershwin.